A typical bee-cater of open country, this species has a thin, downeurved bill, long, narrow wings, and two thin tail streamers which are made up of the elongated central tail feathers. A useful identification feature is the combination of a white brow, a white throat, and a pale breast below a black neck band. This is a migrant species, alternating between two habitats. It breeds in dry, very open country with some thorn scrub, and winters in moister savanna (tropical grassland) and forest borders and clearings. Flight is light and fast, with frequent glides, either straight or in circling patterns. The bee-eater usually hunts from a low perch, taking flying insects, particularly bees and wasps, It recognizes ones that are venomous and holds them carefully in the tip of its bill, rubbing the sting of the insect against a perch or the ground to discharge the poison, after which the prey can be swallowed safely. Flying termites are taken avidly when they swarm. Insects arc also captured on open ground, as well as spiders and small lizards. This bird is highly sociable and often occurs in parties and flocks. In cooler weather, and when roosting, birds are seen huddling together in tightly packed rows on perches. When breeding, however, birds roost in their nest burrows. Breeding usually takes place in large colonies. The flock selects a site and then all the pairs excavate their nest burrows simultaneously, apparently stimulated by the activity of the group as a whole. The pairs show few signs of territorial behavior and limit themselves to guarding a small area around the entrances to their burrows. In this species, a majority of pairs in a colony are likely to have at least one additional individual helping in nesting tasks, and up to six "helpers" have been recorded at a single nest. 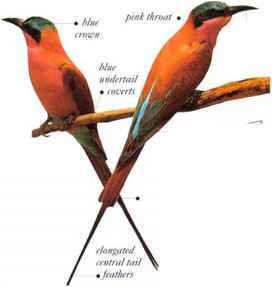 I his bee-eater has an unmistakable pattern, being blue underneath and bronze above, with a yellow throat. I lowever, because the bird is usually seen in flight, the w hole pattern is not always visible. A vigorous, liquid "quilp" call is often the first thing to draw attention to the bird. 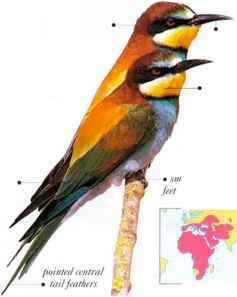 The European Bee-eater favors open habitats with scattered trees and bushes. It spends much of its time hunting in the air. but also perches on high, bare-twigs and telephone wires. The diet consists of insects, mainly bees and wasps, caught in the air. Sociable at all times of the year, birds are almost always seen in parties or flocks. Nesting colonics are located in earth banks or cliffs. • NEST An unlined chamber at tile-end of a burrow up to 5 ft (1.5 m) long. 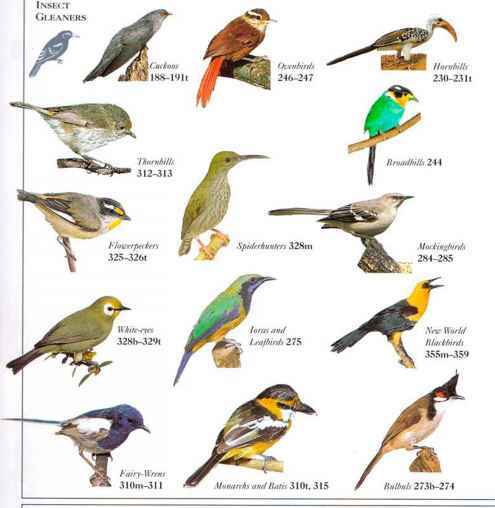 • DISTRIBUTION Breeds from S. Europe and N.W. Africa to N. India, and in South Africa. Winters in much of tropical Africa, and in W. India.